"I started dancing in 1988 and have been teaching dance since 2008; I love dancing too much to keep it a personal hobby, and my passion is infectious. Ballroom, Latin, Line Dance, Jazz Funk, Hip Hop or K pop, nothing is impossible so just join us and impress your guests. I look forward to seeing you on the dance floor." "Instructing Wedding Dance is something that opens both body and mind. I believe it's a fantastic way for a couple who are soon to be married to develop in their relationship together and learn a skill that will not only be useful on their wedding day but also for life. I often find the fiancé might be reluctant to dance at first but in fact he often ends up enjoying it just as much, if not more than his fiancée! I have seen many couples go from 'zero to hero' as they come in expecting not to be able to dance together, yet leave with a whole choreographed and professional-looking dance in just 4-6 classes. No matter if you have 2 left feet, you can do it!" 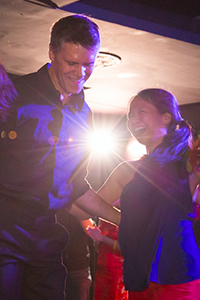 "I was inspired to start HK Wedding dance after founding the Ceroc dance franchise in Asia over 10 years ago (Hong Kong, Singapore, Malaysia). What I love about teaching a first dance is the sense of the journey each couple embarks on as they lead up to their special day. It’s a privilege to see the transformation from those who hardly (or never) danced to the Bride and Groom who bring laughter and joy not only to themselves, but also their guests with their own unique wedding dance."